Modern day families live a hustle and bustle lifestyle. Between driving kids to activities, working, shopping and maintaining a household, there is little time to think about the environment. Many decisions are made hastily and in the name of convenience because there is simply not enough time to plan for the long term and the big picture. The solution to this dilemma is to implement small changes that, over time, will become habits and part of the daily routine. 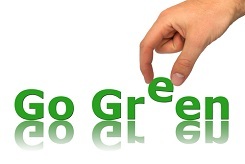 As you change over to living greener, you will find that you often save both time and money in the long run. More importantly, you will be saving the planet and making it a better place for your children and for generations to come. Food is a great place to start when changing over to a more environmentally friendly practice. The first thing you will want to do is buy organic whenever possible. You don’t want to feed your family the pesticides found on many commercially grown crops or the hormones fed to much of the livestock. Shopping at a local farmer’s market is a wonderful way to get organic foods and support your local farms. A convenient way to fit this in is seeking one out that is nearby to your children’s activities so that you can pick up the produce while waiting for the kids to finish up with a practice or club meeting. If you have the time to go a step further, try growing some of your own foods in a pesticide free garden at home. Try to ditch the processed foods that are filled with preservatives and chemicals. Keep a bowl filled with fruit accessible to the family for snacking. Veggies and dip are another healthy snack option. You can also bake some homemade snacks so that you can control the ingredients. If you are worried about the cost of buying organic foods, remember that if you take some other green steps, such as cutting down on your meat intake and no longer buying commercial cleaning products, your grocery bill should not show any significant changes. Another food related tip is to stop shopping for beverages altogether. The best drink for anyone in your home is water. You don’t need to buy cases of plastic water bottles to obtain it, either. Instead, invest in reusable bottles for the whole family that they can take on the go. If you do not like tap water, make another one-time purchase of a water filter. If you are a coffee lover and often visit your favorite coffee shop in the morning or between stops after school, consider buying one of their reusable cups rather than a paper or foam cup each day. If you do wind up with an old paper cup, think about using it as a planter or rinsing it out and using it to clean paint brushes during the kids’ next craft project. When it comes to preparing foods, use the microwave as little as possible. If you must use the microwave, be sure to never use plastics in it. The Environmental Working Group states that certain chemicals in plastics have been linked to birth defects, and these chemicals are released when heated. In fact, avoiding plastics as much as possible is a good rule of thumb because they are terrible for the planet anyway. The worst offenders that you will want to avoid are those marked with a three, six, or seven on the bottom. For cleaning, there is no reason to buy chemical products. White vinegar can clean almost anything. If you also add castile soap, tea tree oil, baking soda and borax to your cleaning cupboard, you will be all set to clean your home from top to bottom with all natural substances, and for a fraction of the usual cost. Since you will be mixing your own cleaners, you will also be able to reuse the spray bottles, causing less waste. When you take your trips to the store, be sure to bring your own reusable shopping bags. They don’t have to be anything fancy or expensive. Anything you have at home that can carry groceries will do. If you can reuse bags, then factories will produce less of them. This saves trees in the case of paper and prevents harmful chemicals in the case of plastic. With paper, there are lots of ways to save. First, instead of sending out letters and invitations, use email and evites. To clean out your own physical mailbox, consider opting out of junk mail. Catalogchoice.org and DMAchoice.org are two websites you can visit to do this. You can also go paperless with most of your bills by visiting each company’s website or making a phone call to let the company know that you prefer to have your bills sent electronically. On holidays, be creative. Think of wrapping a gift in something you have around the house, like newspaper, fabric or brown grocery bags. Making your house run more efficiently is not as difficult as most people think. You can take some simple steps that will save your family a lot of money and the planet a lot of energy. Start with the refrigerator, because this is the appliance that uses the most electricity. Unplug it and clean the coils every six months with a vacuum attachment. Ensure its settings are placed where they are most efficient: between 38 and 40 for the fridge and zero and five for the freezer. Next, think about your water use. Consider replacing fixtures and toilets with low-flow versions. Use water saving shower heads, and think about getting faucet aerators. Only run your washing machine and dishwasher when they are fully loaded, and when it comes to clothes always use cold water. Replace your standard light bulbs with energy efficient fluorescent ones, and leave notes near room exits to remind family members to turn off the lights when leaving. When you have items plugged in, even if they are turned off, they are using energy. Use power strips to plug these in so that you can shut the strip off easily instead of having to unplug each item one by one. When cleaning out clutter in closets and garages, instead of just throwing things away, consider freecycling the items instead. Freecycling is just a fancy way of saying “giving it away.” What you don’t want, someone else may be able to use. You can donate the items or visit The Freecycle Network’s website and post what you have to offer to your local group. Often, someone is willing to come and pick up your unwanted clutter the same day. You can also utilize online classifieds such as Craigslist to give away items. This keeps items out of landfills and allows someone else to put them to good use. Busy families spend a lot of time in their cars commuting to work and activities. If you find your child has a local friend attending the same activity, ask the parents if they would like to have the kids carpool and take turns driving. This can free up time and gas money for both families, while reducing harmful toxins in the air. Keep your tires pumped up to save gas. When it comes time for a new family vehicle, consider a hybrid. Children learn from their parents, mainly from watching what their parents do. The best thing you can do as a parent is instill a love for the planet in your children by cultivating that within yourself. When your kids see you taking care and pride in your environment, they will learn to do the same. Taking walks out in nature, playing outdoors, flying kites and watching the sunset are all wonderful activities that can deepen your family’s relationship with the Earth and help them appreciate the need for a greener lifestyle. Choosing to live green benefits everyone in many ways. The planet as a whole supports you better, your health thrives and your finances improve. Each of these simple changes can be implemented over time without the family feeling any major shift in their routines, yet the impact this green makeover will have on your family and your surroundings is priceless.